A notification is a message sent to one or more observing objects to inform them of an event in a program. The notification mechanism of Cocoa follows a broadcast model. It is a way for an object that initiates or handles a program event to communicate with any number of objects that want to know about that event. These recipients of the notification, known as observers, can adjust their own appearance, behavior, and state in response to the event. The object sending (or posting) the notification doesn’t have to know what those observers are. Notification is thus a powerful mechanism for attaining coordination and cohesion in a program. It reduces the need for strong dependencies between objects in a program (such dependencies would reduce the reusability of those objects). Many classes of the Foundation, AppKit, and other Objective-C frameworks define notifications that your program can register to observe. The centerpiece of the notification mechanism is a per-process singleton object known as the notification center (NSNotificationCenter). 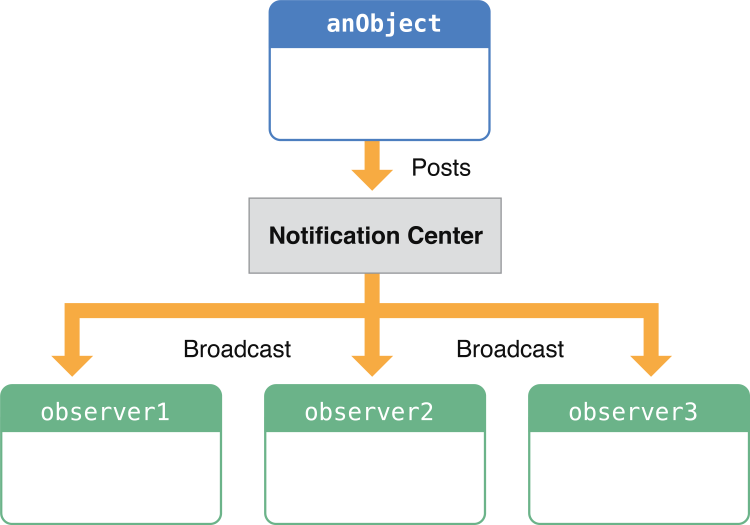 When an object posts a notification, it goes to the notification center, which acts as a kind of clearing house and broadcast center for notifications. Objects that need to know about an event elsewhere in the application register with the notification center to let it know they want to be notified when that event happens. Although the notification center delivers a notification to its observers synchronously, you can post notifications asynchronously using a notification queue (NSNotificationQueue). A notification is represented by an instance of the NSNotification class. A notification object contains several bits of state: a unique name, the posting object, and (optionally) a dictionary of supplementary information, called the userInfo dictionary. When a notification is delivered to an interested observer, the notification object is passed in as an argument of the method handling the notification. In this handling method, you can extract information from the notification to help you in your response, especially data in the userInfo dictionary (if one exists). To post the notification, send a postNotificationName:object:userInfo: (or similar) message to the singleton NSNotificationCenter object. This method creates the notification object before it sends the notification to the notification center.